'TRULY A HEAVEN'S VIEW' If you want a vacation memory, stay here and wake up to wonderful views from the master bedroom or enjoy the hot tub sitting high on the newly removed VERY LARGE deck for the great mountain view. In the fall the Daniel Boone National Forest goes to sleep under a blanket of fog. From the deck you can relax and watch a crisp, cool, fall night unfold. In the mornings the fog begins to burn away, unveiling a kaleidoscope of fall colors and the sparkling lake below. This 3 BR cabin sleeps 8 people comfortably with 3 Queens and a Queen sleeper sofa and 2 BA. Amenities are 2 TV's, DVD player, cable TV, hot tub, gas BBQ grill, gas fireplace, Jacuzzi tub in master bathroom washer/dryer, Mountain View, pool table, many family board games in hall and a phone for local calls. The cabin is located within the secure, gated Lake Cumberland Resort. $300 security deposit required upon reservation by credit card. Check in 4pm, check out 10am. Weeks are counted as 6 nights with check out on the 7th day. Rental agreement must be signed prior to arrival. Fantastic view of the mountain valley, enjoy the seasonal view, the fall view of the changing leaves is the best! the place was stunning and I will be back! View was amazing from the back of the house😊! House felt comfortable, beds not so much😕. And hot tub was hot when covered but wouldn't maintain its temperature after being in for 15min😕. The view is exceptional. It really is quite an experience. The deck and house sort of feel like you're in a tree house and in the morning you can actually be in the clouds. The rest is sort of just ok.
We stayed for 4 days in October. First impressions of the home were that it was smaller than expected, at least the family room was. The furniture is pretty heavily worn and not especially comfortable. We had 4 people and there was a questionable amount of room for us in there. The pool table was great, and a nice break. Rooms were ok. Even though pictures show a television in the upstairs bedroom, it's not actually connected or functional. Room clocks were there, but not functional. The house was clean, stayed cool in the hot afternoon. Having only 1 shower, and it being on the 2nd floor was a bit odd. Larger families should take note. My wife is allergic to stinging insects, and in the span of our 4 days, we killed 8 paper wasp's that were in the home. Doors were not left open, these were getting in from somewhere. The dishwasher never worked for us. We contacted the rental company on Saturday, and they contacted us and said they'd get back to us, but we never heard anything else while we were there. The microwave over the stove was broken, so the replacement was a tiny 0.7 cu microwave that isn't really enough for a family. The oven took over an hour to heat up a pre-cooked, refrigerated dish that should have been done in 20 minutes. Deck furniture is very worn, torn, used, old, but we still used it. The hot tub was quite dirty after our first day there using it. In all the rentals we've ever stayed in, this was the worst hot tub. We still enjoyed it quite a bit, but it's a very cheap, smaller, Home Depot plug N play variety, and I don't think it's built for this kind of use, or lack of maintenance (like most things in this home). It was so cloudy (and a little foul) by day 2 that the kids were hesitant about using it. Parking was the last issue. Thankfully, we only had 1 vehicle, but the driveway was narrow, and tight. Multiple cars, or equipment would need to plan getting in and out. I would recommend staying here with the caveat that you understand what you're getting yourself into. You will not be disappointed with the view, but you might be disappointed with pretty much everything else. 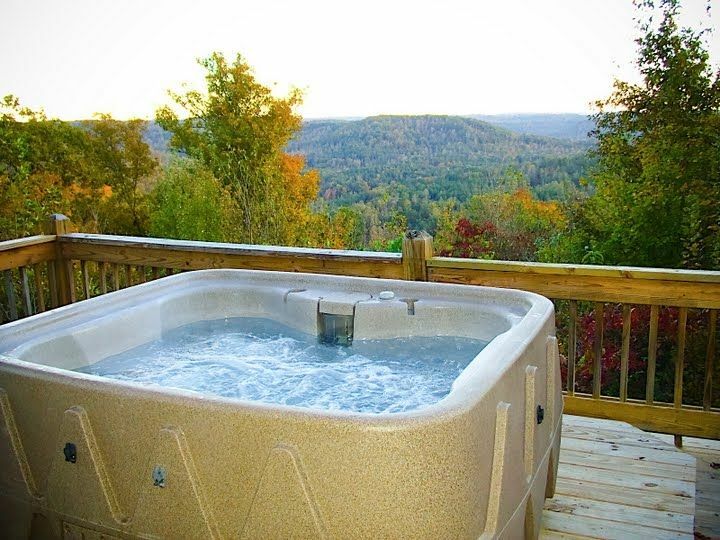 Nice house, great view, hot tub works great. For the price, house could be a little updated. Check in was very straight-forward. The first thing we noticed was that the property was very clean and well-maintained. The kitchen, bathrooms and bedrooms are all well apportioned with the necessities. The view off of the back deck is beautiful and we enjoyed sitting in the hot tub, watching storms roll through in the day, and star-gazing at night. For being part of a development, it was very secluded. Would absolutely stay here again. Be advised: The driveway is very steep, which may be an issue in the winter for some vehicles. Overall a wonderful trip and would stay at this exact home again. Really should take the time to wake up to watch the sunrise and see the fog as it burns off of the water. Very peaceful. No real neighbors to speak of. Went on a jet ski trip. When docking at gate 5 if you go left in the river instead of right to the main lake....the views are great and worth renting here just to get away from everything. We also went right on another trip and to the main lake. Lots of fun jumping waves from the bigger boats. The house was clean and as advertised. The pool table was actually very level for those of you who play a little more then the average person. Kitchen was stocked better then expected for cooking things. Made Alfredo sauce and forgot to bring everything to make it but the kitchen had more then enough stuff for utensils so we still could make it. Definitely worth the money and plan on another trip in a few months to see the leaves change. Rates subject to change each season. Thanksgiving, Christmas and New Year's are holiday rates. $300.00 deposit due at booking and returned within 30 days of checkout if not damages or items missing. Full payment due no later than 30 days prior to checkin. Check out our website at: www.kentuckykabins.com for all our policies.